On October 29, 1970, a total of 23 Christian friends met at the home of the Reverend James and Mrs. Nancy Green with the idea of establishing a new baptist church in Southwest Atlanta. On the first Sunday in November of that year the Greater New Light Missionary Baptist Church held its first worship service. Reverend Green served as pastor and there were more than 100 people in attendance. Services were held at 3462 Delmar Lane. Twenty-nine new people joined the church that day and 40 young people attended Sunday School. It was a glorious start. On February 1, 1973, we the church started a Bond Program with the intent to relocate to a permanent structure. Over $100,000 in bonds were sold and we went forward on our commitment to purchase the church building located at 2540 Campbellton Road SW. This was the place we would call home. Eighteen years after purchasing the building with faith and determination, under Rev. Green's leadership, on Sunday, February 24, 1991, we celebrated and gave God the glory as we participated in a "Burning of the Mortgage and the Laying of the Cornerstone Ceremony." For 21 years Reverend James L. Green served as Under Shepherd. He was a loving and devoted pastor, showing love and concern for all members and friends. Following the retirement of Rev. Green, the church elected one of it's sons, the Rev. Nathaniel Smiley as it's new Pastor. His focus on education and the youth helped to maintain the family structure and harmony of Greater New Light. Rev. Smiley continued the caring and progressive leadership of his predecessor and faithfully served as "under shepherd" for 10 years from August 30, 1992 until November 3, 2002. Rev. Smiley was succeeded by the Rev. Dr. Leland L. Jones, Sr. who began his time as pastor on July 6, 2003. Pastor Jones continued with the growth and the development of Greater New Light until his untimely departure and subsequent deployment with the United States Army. Moving forward, the church elected the Rev. W. Ron Sailor, Jr. as pastor. Multi-talented and skilled as a pulpiteer, Rev. Sailor continued with the established work of God's church for God's people. Deployment completed, Rev. Leland L. Jones, Sr. returned to serve as pastor of Greater New Light. His re-election was made offical on Monday, July 28, 2008. The leadership, spiritual guidance and enthusiasm of Pastor Jones is serving to maintain and to strengthen our fellowship. Foundational members have a renewed spirit, and new members are arriving with a willingness to serve "where ever the Holy Spirit sees fit to place them." "Like a ship that's toss'd and driven, battered by an angry sea. When the storms of life are raging, and their fury falls on me. I wonder what have I done, that makes this race so hard to run. Then I say to my soul, take courage, the Lord will make a way somehow." God has shown us great favor as a people and as a church and it is our prayer that you will allow Him to do the same for you. There is renewed excitement and energy at Greater New Light, but don't just take our word for it, stop by and see for yourself. We are a church who is STRIVING TOWARD EXCELLENCE !!! We invite you to become a part of our growth. Whatever your talents, gifts, ideas or desires we will do our best to help you to serve as Lord has blessed you. We are members of SWEEAC (Southwest Ecumenical Emergency Assistance Center) where we pool our resources with other churches to help to distribute food and clothing weekly. Get involved! Bring your talents, your gifts and your volunteer spirit and we can strive for excellence together. 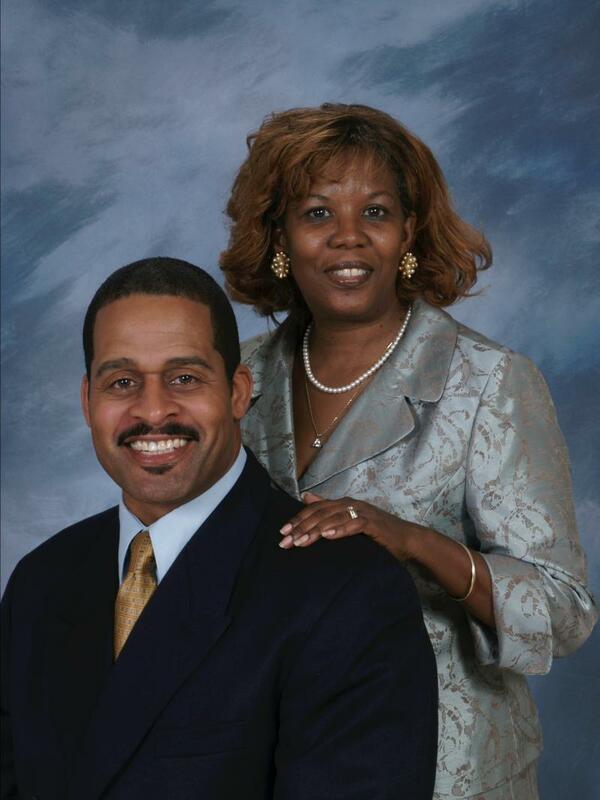 Leland L. and Norma J. Jones are the Senior Pastor and First Lady of the Greater New Light Missionary Baptist Church. Pastor Jones was born in Kansas City, Missouri, to Ardie Mae and the late Cleveland Jones, Jr. and raised in Akron, Ohio, Dr. Jones accepted God's "call" to preach the gospel and was licensed by the Rev. Dr. T. DeWitt Smith, Jr. at the New Hope Baptist Church. After completing high school he moved to Atlanta to attend Morehouse College. There he gained an understanding and an appreciation of what it means to be "young, gifted and black." While at Morehouse he joined the West Hunter Street Baptist Church and was later ordained by the late Rev. Dr. Ralph David Abernathy, Sr. In 1991 Rev. Jones began serving as pastor of the Mount Calvary Baptist Church in the beautiful hills of Tate, Georgia. For twelve years he lovingly served the people in that blessed community that exemplified the love that "flows from heart to heart, and from breast to breast." He was pivotal in growing the small rural congregation into a thriving and spiritually directed Christian fellowship. In July of 2003 he began his service as pastor of Greater New Light. Under his leadership our church has experienced a re-birth and an extra dose of spiritual energy. Members, new and old, are joining or re-uniting with the Greater New Light Family and are helping us to thrive in an atmosphere of Christian harmony, spiritual development and social inclusion. Rev. Jones has the ability to make people feel special and needed in the body of Christ and also within the network of our church. At Greater New Light everybody is somebody special and under the leadership of Pastor Jones we are striving toward Christian maturity, mutual respect and excellence in all that we say and do. Pastor and Sister Jones have two daughters, Rikilla and Tiara, and one son, Leland Jr. They also have a "gaggle" of grandchildren. Sister Jones is a school teacher in the Atlanta area. She holds degrees and certifications from Berry College and Covington Bible College. Rev. Jones holds degrees and certifications from Atlanta Junior College, Georgia State University, Luther Rice Seminary, Columbia Southern University, Covington Theological Seminary and the Interdenominational Theological Center. Pastor Jones serves on a variety of civic, social and community service and advisory boards while also serving as Chaplain for the Tuskegee University Football team (since 2011) and he also serves as a Chaplain in the Georgia Army National Guard. He is ecclesiastically endorsed by the National Baptist Convention, USA, Inc.
Pastor and First Lady Norma J. are both personable and approachable. Stop by, call or visit and see for yourself.